Sales of San Francisco 49ers quarterback Colin Kaepernick jerseys have skyrocketed in the wake of his refusal to stand for the national anthem, which he says is protest against America's treatment of "black people and people of color." 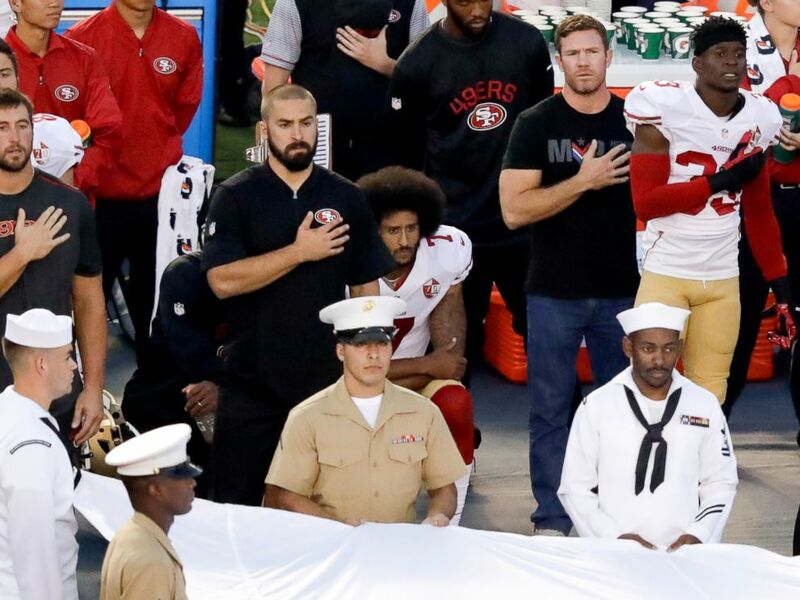 Kaepernick's decision not to stand during the playing of the anthem, which was first noticed by the media in a preseason game against the Green Bay Packers on August 26, has added to the debate in America over the subjects of race, patriotism, sports protest and violence by and against police. News of Kaepernick's growing marketability, at least in terms of jersey sales, adds an additional layer of complexity to the story of his protest. San Jose Mercury News reporter Mike Rosenberg first noted on Twitter that sales of Kaepernick jerseys had jumped from 20th among 49ers players to first. Even though he is only a backup quarterback, Kaepernick has now moved to fifth overall among NFL jersey sales, according to NFL.com, jumping from eighth a day ago. Some fans reacted by burning his jersey and other memorabilia on social media in the wake of news breaking about his protest. Among the quarterback's most vocal critics have been police officers. Kaepernick drew additional criticism after photos surfaced of him wearing socks that depicted police officers as cartoon pigs. "I have two uncles and friends who are police officers and work to protect and serve ALL people," Kaepernick said on Instagram in defense of the pictures. Ali, Smith and Carlos Protests Left Lasting Impressions. Will Kaepernick's? San Francisco 49ers quarterback Colin Kaepernick, middle, sits during the national anthem before the team's NFL preseason football game against the San Diego Chargers, Sept. 1, 2016, in San Diego. The union for Santa Clara, California, Police Department officers -- the police who work San Francisco home games -- said that its members would consider boycotting their duty to police the stadium if the 49ers don't discipline Kaepernick for his actions. Santa Clara Police Chief Michael Sellers offered a rebuke of that position on Saturday, saying that "officers are here to protect the rights of every person, even if we disagree with their position," but also expressed sympathy for the union's sentiment. Kaepernick was scheduled to speak at Third Baptist Church in San Francisco today in front of a largely black congregation that included members of the NAACP, but he cancelled, citing scheduling concerns. The other speakers at Third Baptist church today addressed Kaepernick's stance with words of support, and voiced criticism over the police, and Donald Trump and his supporters, who one woman called "bigots." 49ers coach Chip Kelly announced this weekend that Kaepernick would be the team's backup quarterback, ahead of third-stringer Christian Ponder, and behind starter Blaine Gabbert. Kaepernick is guaranteed $11.9 million in salary for this season and can earn another $2 million in roster bonuses depending on playing time, according to NFL.com. Some analysts thought that Kaepernick could be cut by the team because of the attention he was receiving, but that has not turned out to be the case so far. Dave Zirin, a sports editor for The Nation and a historian on sports protests, told ABC News in an interview last week that Kaepernick’s precarious spot on the 49ers roster only served to strengthen the power of his protest. "He's really risking something by doing this," Zirin said. "It’s all the more admirable that he could be cut by the 49ers." The 49ers are scheduled to host the Los Angeles Rams in a game on Monday, September 12. He is expected to continue to protest the anthem at that game. "When there’s significant change and I feel like that flag represents what it's supposed to represent in this country, I’ll stand,” Kaepernick told reporters one week ago.